I got a pair of Knuckle Lights for Christmas last year. I used them on every o'dark thirty run I did this year. They got particularly heavy use during May, June, and July, averaging 10-12 miles per week. Knuckle Lights are worn on your hands. You adjust the straps so they are wrapped around your upper fingers close to your knuckles and you aren't exerting any pressure or thought to actually holding them. As someone who doesn't like to run with something in my hands, I think these are great. The straps are flat on the palm side so when I have the Knuckle Lights on I am able to get things out of my pockets without taking them off. If I need to, I can hold something like my phone or a bottle of water the lights don't interfere. I like having a light in my hands. Sometimes I run with a light on my hat or a headlamp, but you know who likes lights? Bugs. Florida bugs. So having lights in my hands keeps bugs away from my panting open mouth. 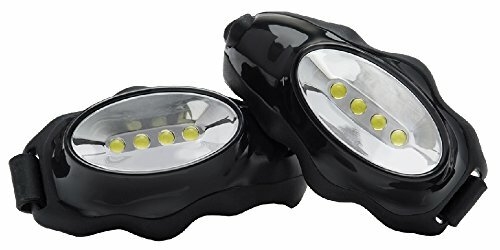 I also prefer these to shoe lights because I can direct the light around me where I need to see, not just directly in front of me. The lights run on 2 AAA batteries each. The light starts to fade when the battery life isn't optimal, so I can finish a run without the lights going out completely. They have three settings: bright; low light; and blinking. A couple of months ago I had a problem with one of the lights. The plastic buckle on one of the straps broke. I was able to fashion a temporary fix with a rubberband. Meanwhile, I wrote to Knuckle Lights, and they sent me a few spare buckles, so I'm good to go again.